Registration is open to join TransOptions’ 2019 Bike to Work Challenge. The goal of this competition is to encourage commuters to use their bikes more often instead of cars. The Challenge will run from May 1 to May 31. See the Bike to Work Challenge webpage for more details. The Morris County Board of Freeholders has announced the 2019 list of county road paving projects that will target more than 25 miles across 23 municipalities. See the list of 2019 County Road Paving Projects. TransOptions is sponsoring a challenge this fall to encourage less driving alone and improve air quality. Register and log your bike, walk, or carpool trips, instead of driving alone, between October 2 and October 23. Visit TransOptions’ TripSwitch webpage for details. The final design of the NYS&W Bicycle and Pedestrian Path will be presented at two public meetings in October in Pequannock and Wayne before the project moves on to its construction phase. The Path will be a 4.8-mile shared-use path starting at River Drive in Pequannock, near Route 23, connect to the township’s Aquatic Park, and extend into Wayne at Mt. View Boulevard, just a short distance from NJ Transit’s Mountain View train Station. See the NYS&W press release for meeting details. NJDOT is rehabilitating the Route 495 Viaduct, a nine-span bridge constructed in 1938. The bridge is located along Route 495 that connects the New Jersey Turnpike to the Lincoln Tunnel in Hudson County. The project is expected to take two and a half years and cause congestion as a result of lane closures. Visit the project website for more details and status updates as construction advances. On October 18, 2018, the Morris County Planning Board adopted its new Circulation Element of the Morris County Master Plan. This new 2018 Circulation Element provides a comprehensive review of current conditions and transportation trends, and presents strategies to address current and future transportation needs. 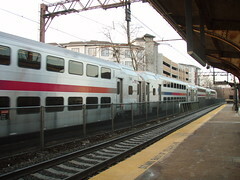 It will serve as a guiding document for transportation planning and investment in Morris County for the next 25 years. Street Smart Safety Campaign is a public education and awareness campaign created and coordinated by the NJTPA in order to help encourage safer decisions by drivers and pedestrians. For more information, please visit the Street Smart website.